At its core MultiCamZilla is a wired/wireless PTZ (pan tilt zoom) controller that transforms your compatible LANC or Panasonic video camera into a PTZ camera capable of being wirelessly remote-controlled. Use it to augment your manned cameras, give yourself the ability to remotely “touch-up” your lockdown shots, or run the whole shoot yourself with integrated switcher control. MultiCamZilla is a revolutionary one-man-band style production system that allows a single operator to remotely control up to 8 cameras (expandable beyond 8 with customization). An ideal solution for mobile setups or fixed installations, MultiCamZilla is perfect for production companies, music venues, houses of worship, schools – anywhere you need affordable multicamera video production. Compatible cameras include JVC (i.e. GY-HM200U), Canon (i.e. XA-35), Sony (i.e. PXW-X70), BlackMagic Design (i.e. Micro Studio 4k), and most other cameras that have a LANC port. 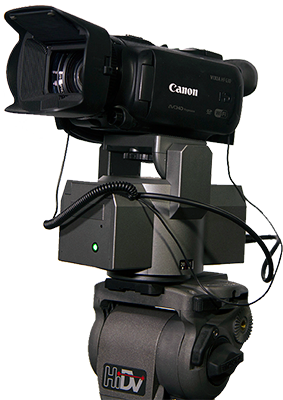 MultiCamZilla v2 also introduces support for many Panasonic camcorders that use their standard “two-connector” protocol, including the popular DVX200, UX-90 and UX-180. MultiCamZilla allows a single operator to run 8 cameras simultaneously. Integrates with BlackMagic Design ATEM switchers to facilitate easy live switching. Combine MultiCamZilla with a wireless HDMI transmitter (not included) for quick cordless setup. Our system allows to you achieve professional results with much less crew – resulting in savings for you. 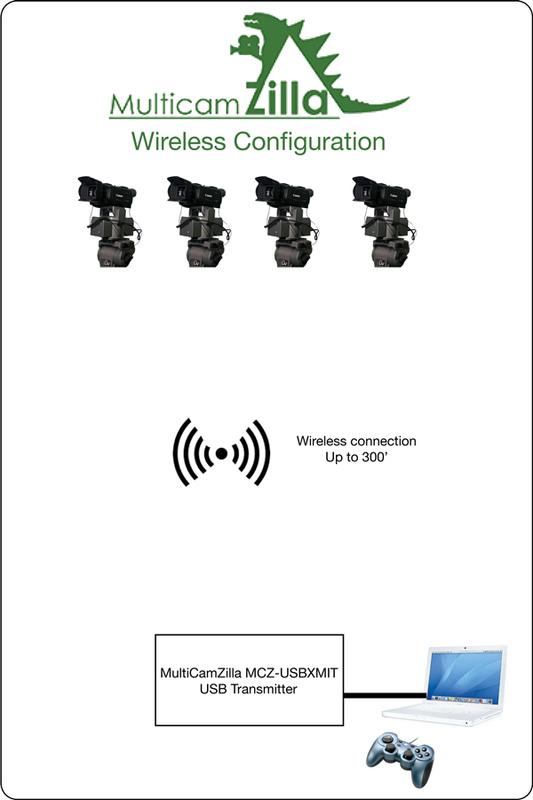 MultiCamZilla is a wireless camera control system that allows a single operator to control up to 8 cameras, and also perform a live switch (currently compatible with BlackMagic Design ATEM switchers) all from a single PS3-style controller. Pan, tilt, zoom, focus and IR menu control (for select Canon cameras) are all right at your fingertips. You can use MultiCamZilla as a one-man-band style production system, or use it to augment manually operated cameras to provide additional coverage without the additional cost. Combine MultiCamZilla with a wireless HDMI transmitter (not included), and you have a completely wireless camera control and image transmission system, allowing you to put cameras where cables won’t allow, and drastically reduce your setup time. MultiCamZilla v2 includes all the great features of the original MultiCamZilla, with the addition of a new model that supports many popular Panasonic camcorders including the 4k UX90, UX180 and DVX200. We’ve also responded to one of our most frequent feature requests, and added wired connectivity in addition to wireless. 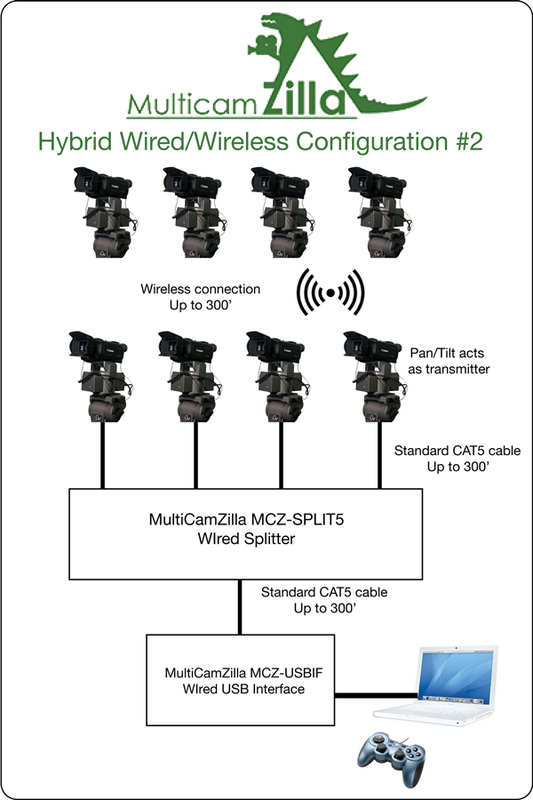 The connectivity of the MultiCamZilla v2 system is now completely flexible, as any MultiCamZilla v2 pan/tilt can be controlled via a wired connection (using standard CAT5 cable) or wirelessly using our existing wireless protocol. 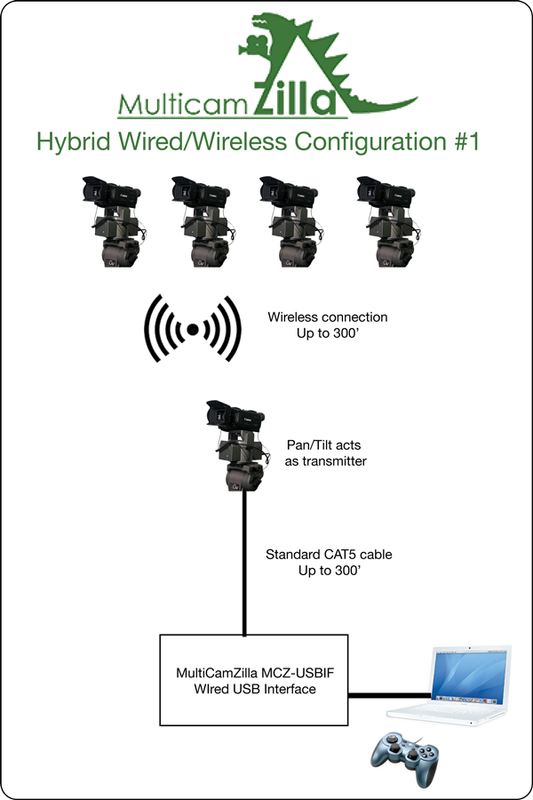 Using a standard CAT5 cable, you can now connect to your MultiCamZilla pan/tilts located in your performance area, to a control-room located in another part of the building, or even a remote truck. 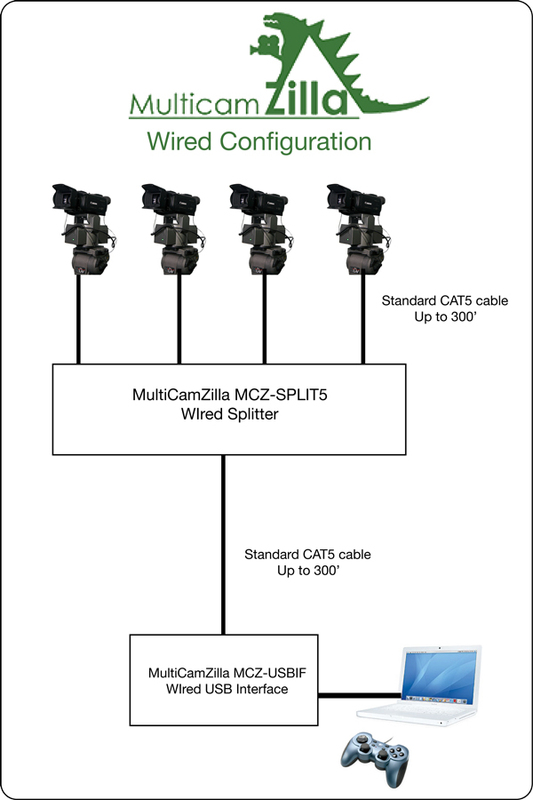 Simply run a single CAT5 cable (up to 300ft) from your control-room to a MultiCamZilla Wired Splitter located in your performance area, then, connect your MultiCamZilla v2 pan/tilts to any one of the splitter’s outputs via a CAT5 cable (up to 300ft). As another option, if you don’t want to run individual cables to your MultiCamZilla pan/tilts, and prefer to work wirelessly, but you are controlling the system from a remote location, you can run one CAT5 cable (up to 300ft) from your control room directly to any one of your MultiCamZilla v2 pan/tilts in your performance area, and assign that pan/tilt to become the transmitter to send to your other MultiCamZilla pan/tilts wirelessly. The system is extremely flexible. MultiCamZila v2 also introduces support for many Panasonic camcorders that use the standard Panasonic “2-port” (3.5mm and 2.5mm) connections for start/stop, zoom, focus and iris. This includes support for the very popular DVX200, UX90 and UX180 4k cameras. The MultiCamZilla transmitter and controller connect to your Macintosh computer via USB. After installing the supplied software and setup file, the transmitter then sends signals to the pan/tilt heads, giving you complete control of your camera. You can control up to 8 cameras using the camera select buttons on a single controller. When you select a camera, it will also send a command to the “ATEM Software Control” application to select that camera on the “preview” buss. The camera you are controlling will then always be on the preview buss. Once you have your shot framed, you can press the “take” or “dissolve” buttons on the MultiCamZilla controller, and the switcher will perform the transition. This integrated control allows a single user to both operate the cameras and perform a live switch, without ever needing to take their eyes off the screen. *For IR Menu Control: Canon Vixia HF-S200, HF-S20, HF-S21, HF-S30, HF-G20, HF-G30, HF-G40, XA25, XA20, XA10, XA30, XA35. As with all wireless systems, the environment plays a huge factor in your range. Keeping your transmitter elevated by putting it on a stand, and, ideally, maintaining line-of-site with the receivers will give you the most range. This system can transmit over a mile in ideal outdoor conditions, but realistically 300-400ft indoors line-of-site can be expected. Why use a game controller instead of a PTZ joystick or something else? When running multiple cameras and switching live at the same time, the most important thing is to get as many controls directly under your fingers as possible, so you never have to take yours eyes off the screen, and can work purely by feel. A PS-3 style game controller, like the Logitech Rumblepad 2, provides exactly the right amount of control, and embodies over 30 years of controller evolution, with comfort and long-term usability as key design factors. For a system like this, there is nothing that can put as much power at your fingertips than this type of controller, which is why we are using it. Can the camera positions be re-called? No, this is a real-time only system. As great as recall would be, it would drive the cost up significantly. What kind of cable does the wired connection use? Is it ethernet? MultiCamZilla v2 uses standard CAT5/6 cable with standard ethernet pinout, but it is NOT ethernet, so it cannot run through a hub or switch, it must be a point-to-point connection from either the MCZ-USBIF or the MCZ-SPLIT5 to the pan/tilt. Can I use the system for just camera control and not switching? Yes, you can disable the ATEM Control Software commands in Controllermate, so only the camera control commands will be sent, not the switcher commands. Another operator can even use the same Mac to switch the ATEM, using a keyboard or external USB device like an X-Keys, the camera control will run in the background. Do you have a version that will work on PC? No, this is a Macintosh-based system. You can pick up a used MacBook for under $300 and use it as a dedicated control computer if you don’t have a Mac. Can the controller functions be changed? The user interface to the controller is designed in the ControllerMate object-oriented environment, so you are free to edit the functions if you desire. You will want to familiarize yourself with ControllerMate programming before attempting any changes. Since everyone likes to work a bit differently, one of the big advantages of this system is that you are free to change or expand the controls to suit your needs. How long will the battery (if ordered from the website) last? The MultiCamZilla units draw very little current when idle, so depending on how much panning/tilting you are doing, a conservative estimate is greater than 8 hours. If you use the USB port to power a wireless HDMI transmitter in addition to your MultiCamZilla unit, the runtime is around 5-6 hours (assuming ~500ma draw from the HDMI transmitter). You should always do test runs to determine real-world battery life. Can I use any 12v Li-Ion battery? You can purchase higher capacity batteries on-line. Any 12v Li-ion battery pack should work fine with MultiCamZilla units, just be sure to observe proper polarity. The batteries we sell are a good physical size for the system, and also have a charge level indicator, which is very useful. Why did you decide to design and sell this system? This system is the result of a life-long obsession with multicamera video production, and a desire to push the limits of what can be done with a small budget and limited (or sometimes zero) crew. I have shot hundreds of concerts and other events using various incarnations of this system during its development, and now I want to empower other people to add multicamera capability to their systems as well. MultiCamZilla comes with a 30 day money-back guarantee. MultiCamZilla equipment comes with a 1 year repair/replacement warranty.